SERRATED TOOTH DISC SAFETY LOCK WASHERS ARE USED TO AVOID LOOSENING ,NOT ONLY MAINTAINS TIGHTENING UNDER EXTREME VIBRATION BUT ALSO UNDER HIGH HEAT. FOR DOUBLE PROTECTION JASMA JM-271 HIGH STRENGTH THREAD LOCKER TO BE APPLY. THIS DESIGN PROVIDES A LIFETIME OF WORRY-FREE ADJUSTMENT. 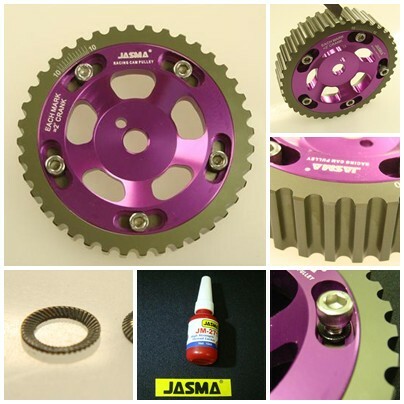 JASMA CAM PULLEY ARE DESIGNED TO INCREASE HORSEPOWER AND TORQUE WITHOUT ANY CAM SHAFT CHANGES. JASMA ADJUSTABLE CAM PULLEY ARE MADE FROM THE HIGHEST QUALITY 6061 T6 ALUMINUM.THEY ARE CNC MACHINED TO MORE EXACTING TOLERANCES THAN ORIGINAL CAM PULLEY. 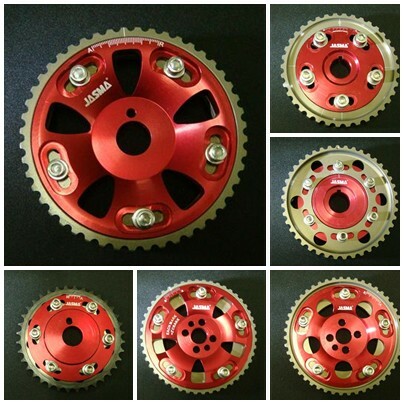 THE OUTER RING OF THE CAM PULLEY IS HIGHLY HARDENED, THE TOOTH EDGES ARE BELEVED TO INCREASE BELT LIFE.